y - a core strategy behind these acquisitions. Persistence Market Research has differentiated key player strategies and focused on brownfield projects based on capacity expansion or up gradation of operating facilities that can provide high and stabilized sales to North and Latin America pump manufacturers. According to this exclusive report on the water pumps market in North and Latin America, the maximum sales of small and medium capacity water pumps takes place through distributors and retailers. Expert analysts who have extensively worked on this report have come to a conclusion that by providing integrated offerings through a diverse range of products and developing a strong distribution and efficient after sales service network at regional and local levels can create significant opportunities for the growth of this market. In order to gain competitive advantage, a strong focus has been given on life-cycle costs analysis, including reducing operating costs through energy-efficient solutions that are highly required for product differentiation. Product-wise weighted Average Selling Price (ASP) has been considered to deduce market values. Average selling price varies by pump type and capacity and is varied for North and Latin America players. A top-down approach has been used to assess market numbers for each product category, while a bottom-up approach has been used to counter validate the market estimations. Factors such as GDP, oil and gas industry growth, mining growth, water and wastewater treatment market, energy and other miscellaneous industry growth have been considered while studying this market. 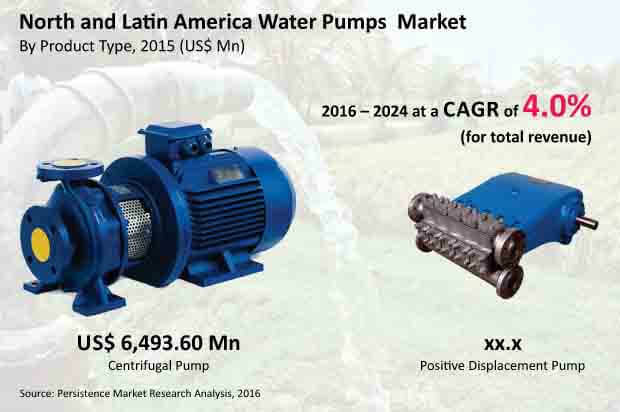 The report on the North and Latin America water pumps market commences with a market overview and provides key market definitions. The report also discusses market dynamics including market drivers, restraints, opportunities, trends and key regulations. Each of these dynamics have been represented in the individual regions of North and Latin America. A qualitative analysis in the form of value and volume forecast for each segment, region and country in North and Latin America has been covered in this report that sets the forecast within the context of the North and Latin America water pumps market including new technological developments as well as product offerings for various applications across high efficiency water pump prototypes in the North and Latin America water pumps market. A competitive landscape has been provided in the last section of the report to present a dashboard view of key players operating in the North and Latin America water pumps market. Detailed profiles of some of the manufacturers in the North and Latin America water pumps market have also been included within the scope of the report to estimate their long-term and short-term strategies, recent developments and offerings in the North and Latin America water pumps market. Given the volatile nature of the global economy, the report not only conducts forecasts in terms of CAGR but also analyzes the market based on key parameters such as Y-o-Y (year-on-year) growth to interpret the predictability of the market as well as to identify the right opportunities for market players. Another key feature of this report is that it includes the analysis of all segments in terms of the absolute dollar. Absolute dollar opportunity is crucial in evaluating the level of opportunity that providers can look to achieve. It also helps identify potential resources from a sales and delivery perspective in the North and Latin America water pumps market. Along with this, Persistence Market Research analysts have also provided strategic recommendations and key success factors for new entrants in the North and Latin America Water Pumps market. Centrifugal pumps are widely used in industrial applications due to their design and function. These pumps are tipped to be the dominant segment outpacing the market expansion and growth of positive displacement pumps. The centrifugal pump segment was estimated to account for a major market value share of more than 90% in 2016 and is expected to gain more than 20 BPS over the forecast period. The centrifugal pump segment is expected to create incremental $ opportunity of more than US$ 3,000 Mn between 2016 and 2024. The segment is expected to reach a market value of more than US$ 12,000 Mn by the end of 2024 expanding at a CAGR of 4.0%. There has been an increasing adoption of micro disc pumping and variable frequency drive technology for centrifugal pumps. Micro disc pumping technology enables manufacturers to create small-sized and energy efficient centrifugal pumps. With ongoing trends such as size reduction, portability, and variable frequency drive operation, demand for small, silent, energy-efficient, and high performance centrifugal pumps is fast gaining traction. Increasing energy costs and growing environmental awareness among end users is expected to drive demand for energy-efficient and cost-effective centrifugal pumps over the forecast period. Depreciating pump efficiency coupled with increasing overhead costs are the key issues for end use industries that rely on centrifugal pumps. Energy-efficient centrifugal pumps reduce annual energy costs and in turn create a positive impact on the environment. Most of the centrifugal pump manufacturers are focusing on optimization of centrifugal pumping systems and increasing production speed. Moreover, rising demand for effective industrial infrastructure, including that for energy and water in developing regions and retrofitting, upgrades and replacement of ageing components in developed regions is anticipated to drive the growth of the centrifugal pumps segment over the forecast period. Centrifugal pumps have been witnessing a higher demand from process industries with growing output, especially in the chemicals, pulp and food and beverage industries. Moreover, rising demand for energy-efficient manufacturing operations in developed nations is in turn expected to increase expenditure in new pumping equipment, ultimately driving the demand for centrifugal pumps. The presence of a large number of Chinese players offering low-priced water pumps acts as a restraint to most North and Latin America players offering centrifugal pumps. The emergence of China as a major producer of low-cost water pumps has disrupted the market to a certain extent. To overcome this challenge, international pump vendors are differentiating their products through various additional services and integration of advanced technologies. The slowdown in capital expenditure across industrial sectors is another factor that is acting as a restraint for the growth of the centrifugal pumps segment. This is due to recessive economic performance across industrial sectors where the supply-to-demand ratio is at a higher rate, thereby prompting the industries to curb their output production and stall their upcoming expansion / capacity enhancement plans. In North America, the centrifugal pumps market is likely to create total incremental $ opportunity of more than US$ 2,000 Mn between 2016 and 2024, expanding at a CAGR of 4.0%. North America was estimated to hold more than 80% value share of the North & Latin America centrifugal pumps market by the end of 2016. The Latin America regional centrifugal pumps market is anticipated to record total incremental $ opportunity of more than US$ 600 Mn between 2016 and 2024, expanding at a CAGR of 4.0%. The growth in mining operations and macroeconomic growth of overall industrial and infrastructure sectors are projected to be the major driving factors boosting the development of the centrifugal pump market in Latin America.